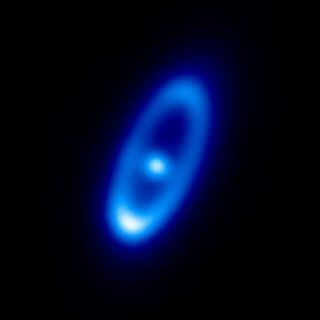 This infrared image shows the young star Fomalhaut and its surrounding dust disc it as seen with ESA's Herschel space observatory. Astronomers suspect Fomalhaut's debris disc stems from dust particles created by prolific comet collisions, with an average rate of 2,000 daily crashes between comets of 1 kilometer across. A young star that is home to at least one alien planet is also ringed by a vast, dusty cloud of comets, like our own solar system. But there's a big difference: There may be as many as 83 trillion comets there, with collisions destroying thousands each day, a new study suggests. In fact, there is so much dust around the star that the equivalent of 2,000 comets, each a half-mile (1 kilometer) wide, would have to have been obliterated every day to create the icy dust belt seen today, researchers say. In an announcement of the discovery, European Space Agency officials dubbed the demolition derby a "comet massacre." The dust also could have been created by few crashes of larger comets – perhaps just two collisions every day between comets 6 miles across (10 km) – but that's still a mind-boggling statistic, they added. "I was really surprised," study leader Bram Acke of the University of Leuven in Belgium said in a statement. "To me this was an extremely large number." Depending on comets' sizes, there could be between 260 billion and 83 trillion comets in the dust belt around the star, the researchers found. If you combined the amount of material in Fomalhaut's dust belt, the mass would be the equivalent of 110 Earths, they added. This illustration shows the size of the debris disc observed around the star Fomalhaut, as compared to the size of the Kuiper Belt and asteroid belt in our solar system. Fomalhaut's comet belt arrangement is similar to the Kuiper belt of icy objects beyond the orbit of Neptune in our own solar system. Scientists have known about a dust cloud surrounding Fomalhaut since the 1980s, though now the Herschel observatory has revealed the ring in greater detail than ever before. Past observations by the Hubble Space Telescope suggested the particles that make up Fomalhaut's dust belt were fairly large. But that theory was at odds with the Herschel observatory's temperature readings of the belt. Herschel observations found that the dust belt's temperature ranges between minus 382 and minus 274 degrees Fahrenheit (minus 230 and minus 170 degrees Celsius) on average. That would correspond to tiny dust particles, each a few millionths of a meter wide, researchers explained. The starlight from Fomalhaut would normally sweep such tiny dust particles away, yet they persist, which led Acke and his colleagues to deduce that a fresh supply of dust is coming from comet collisions. "Since we do observe emission from dust in the disc, this blow-out effect must be compensated by a steady production of dust particles via comet collisions," co-author Carsten Dominik of the University of Amsterdam and Radboud Universiteit Nijmegen said in a statement. One side of Fomalhaut's dust belt is warmer than the other because it is off-center, possibly due to the gravitational influence of a planet. A planet was confirmed to be orbiting the starby the Hubble Space Telescope in 2005. Formalhaut is a relatively young star, only a few million years old, researchers said. It is about twice as massive as Earth's sun. The Herschel space observatory is the largest and most powerful infrared space telescope in orbit today. The European Space Agency launched the infrared observatory in 2009.